Sleep is one of those unavoidable, mission critical facets of life that we cannot avoid. 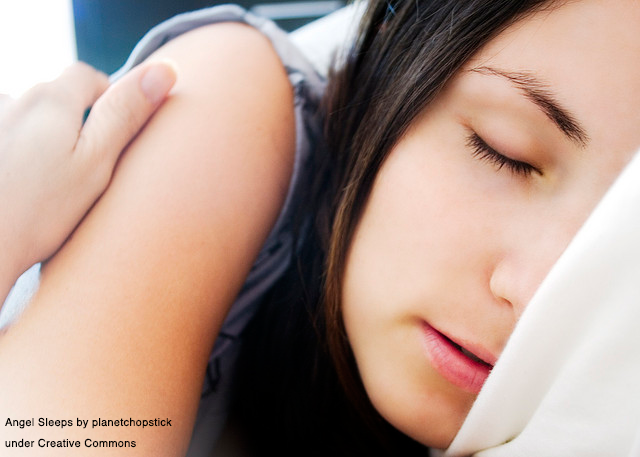 However, many people treat sleep as a mere inconvenience, and spend their whole lives trying to shortcut the process. Whether your bad relationship with sleep is intentional or otherwise, improving your sleep is one thing you have complete control over that can make one of the biggest impacts on your quality of life. To help get you on your way (or remind you of what you already know), we’ve put together a list of ten habits to help you sleep better. Exercise is a great way to use up excess energy. In addition to helping you sleep better, exercising is good for your overall health. Instead of worrying about the time of day you exercise or making excuses, just get out there and do it. Cut out the fast food and freezer dinners, and reach for fruits and vegetables. It may take some time to notice the change, but eating healthy will not only help you sleep better; it will help you feel better and more energized throughout the rest of your day. The human body is mostly water, and needs to stay hydrated. While the amount of water you need to drink depends on the individual, chances are you aren’t drinking enough. If you’re thirsty, it means you’re dehydrated. Drink enough water throughout the day to where your body doesn’t have to tell you it needs more. 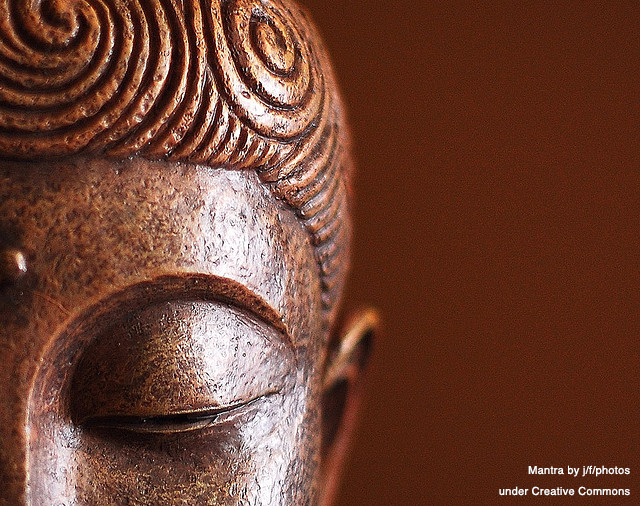 Meditation helps put your mind at ease before falling asleep. I’ve been getting back into it the past couple weeks, and it’s helped a lot. If you’re just beginning, try focusing on your breaths: count one each time you inhale, and when you get to 10 count back down each time you exhale. I usually don’t even make it back down to zero before dozing off. People are creatures of habit, and one of the best ways to sleep better is to make it a routine. If you wake up for work at the same time every day, then you know what time you need to go to sleep to get enough of it. Many people who establish a sleeping routine don’t even need an alarm clock after a while. Instead, their bodies have learned what to expect and the mind serves as its own clock. While a light snack (peanut butter on celery sticks) can actually help you sleep better through the night, a large meal will not. If you eat a lot before bed, your body will continue to digest the food while you’re trying to sleep. It’s a tug of war that you’re never going to win. Instead, try to eat dinner a couple hours before going to bed to make sure you’re body has had enough time to digest. Caffeine and alcohol are two of the prime culprits of a bad night’s sleep, though too much water before bed can also wake you from your slumber in search of a bathroom. Caffeine can affect you up to 12 hours after drinking it, so you may even need to cut back on lunchtime coffees. And while alcohol may seem like it helps you fall asleep, it actually causes midnight restlessness. You need to make sure your bedroom is as dark as possible. One obvious change would be to turn off the lights or television set before you go to bed. If you’ve turned everything off and your room is still brighter than you’d like, consider investing in some blackout curtains. You’ll never be able to reach your full sleep potential in a bright room. Oversleeping can be as bad for your health as not sleeping enough. The average adult needs around 8 hours of sleep, and can vary by a couple hours depending on the individual. In addition to heart disease, depression, and diabetes, oversleeping will leave you feeling more tired when you wake up than you did before. If you don’t have a comfortable bed, then you won’t ever look forward to using it. If you wake up with a sore neck or stiff back in the morning, it may be time in invest in a new mattress or some new pillows. If you’re too hot at night, you can turn down the air conditioning, turn on a fan, or try some new cotton sheets that breathe better. 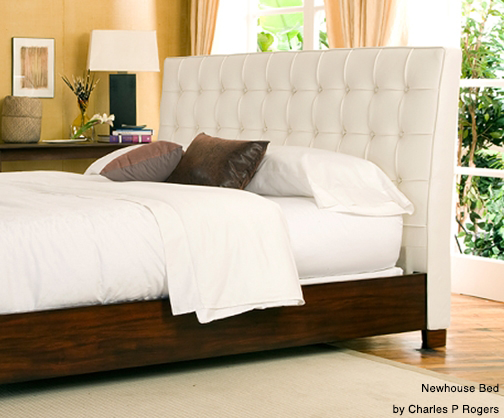 The bottom line is that an uncomfortable bed will ruin what would otherwise be a great night’s sleep. Start here first. Remember: When forming new habits or breaking old ones, the trick is to go slow. Instead of trying to change everything at once, focus on one thing at a time. This will help ensure that your new habits stick, and permanently become part of who you are. Even though you can’t taste the vodka in the baked muffins, I like to think it added a deep smoothness to the batter. Be advised that one pound of fresh, juicy peaches is a lot, so the muffins will be slightly dense and moist at the base. If you like, sprinkle the muffin tops with cinnamon sugar before baking for a sweeter, spiced adaptation. Just don’t omit the vodka in your boozy, summery breakfast in bed. Peel, slice, and chop peaches*. Set aside. Preheat oven to 350°. Cream together butter and sugar. 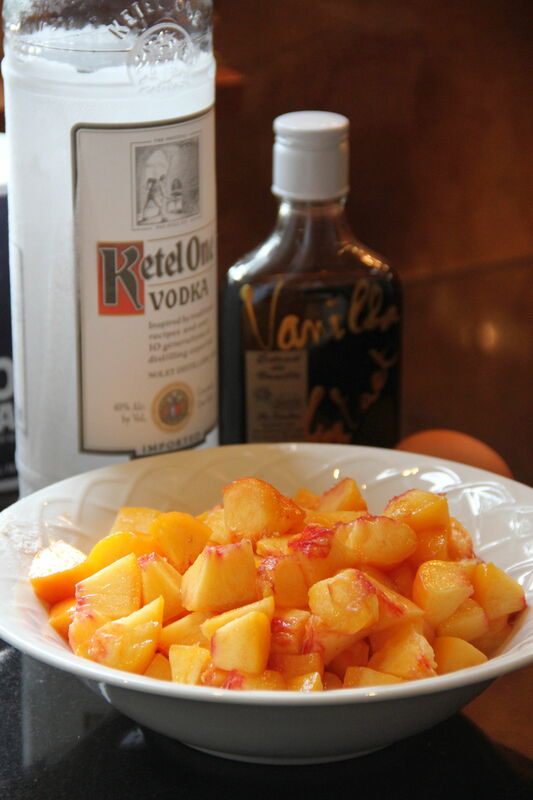 Add eggs, vanilla and vodka and mix well. In separate bowl, sift together flour, baking powder, salt and cinnamon. 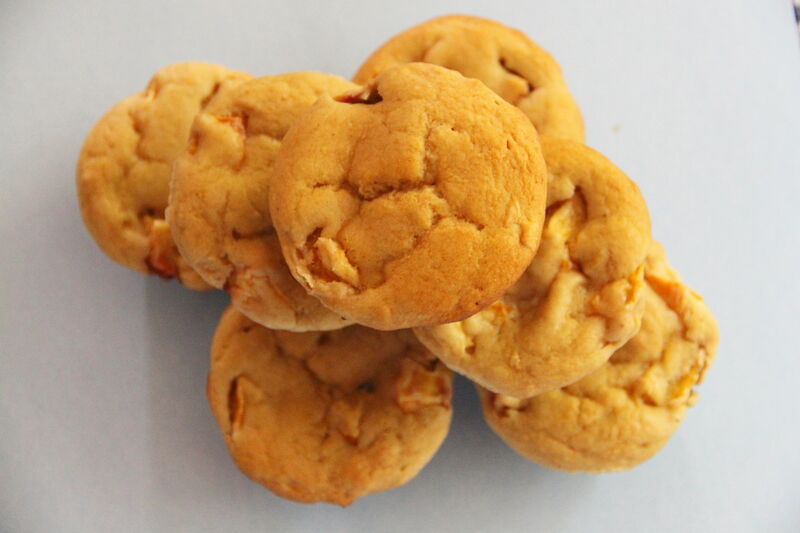 Combine dry ingredients with butter mixture. Stir in sour cream and mix gently until just smooth. 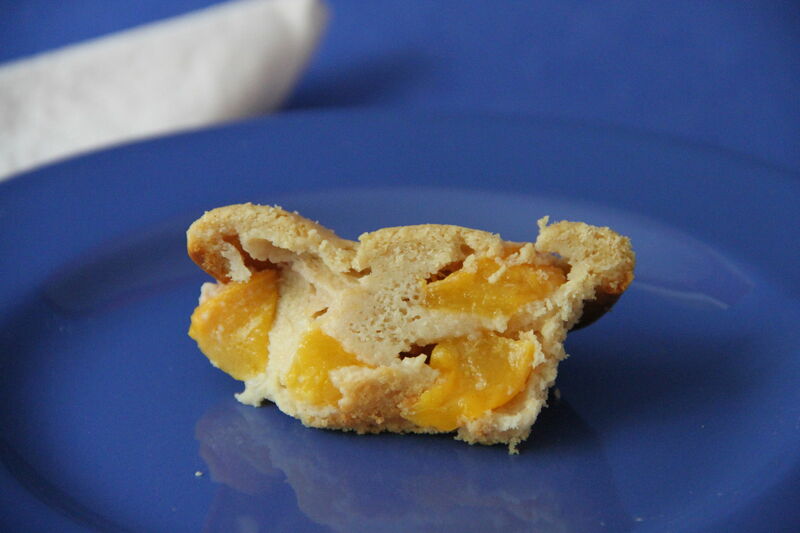 Fold in peaches. Spoon into lined muffin tin and bake at 350° for 40 to 45 minutes, or until toothpick inserted in center comes out clean. Cool slightly on rack before removing muffins from tin. * To easily peel peaches, cut a small “x” in the bottom of the fruit. Carefully drop into boiling water and blanch for up to one minute. Remove peaches from pot and immerse in ice water. Peel off peach skin starting at the “x’. 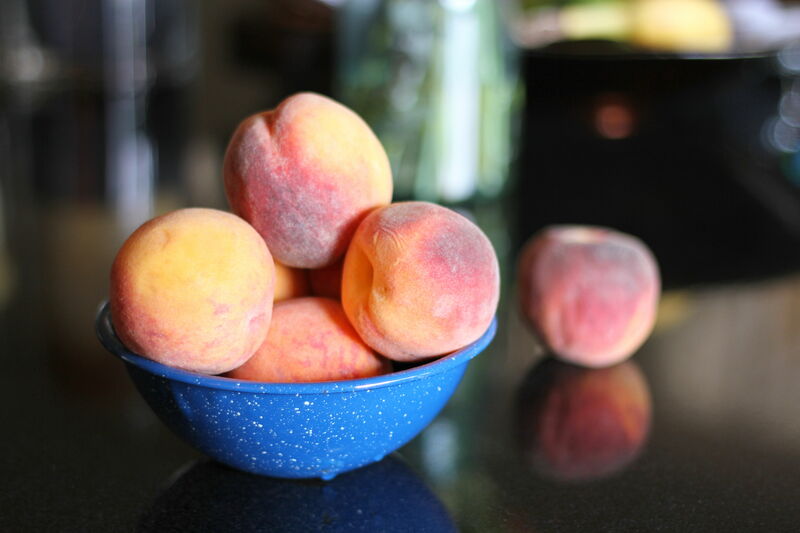 Slice peach by cutting lengthwise to the pit, and pulling slices away from pit. Chop slices into smaller pieces. 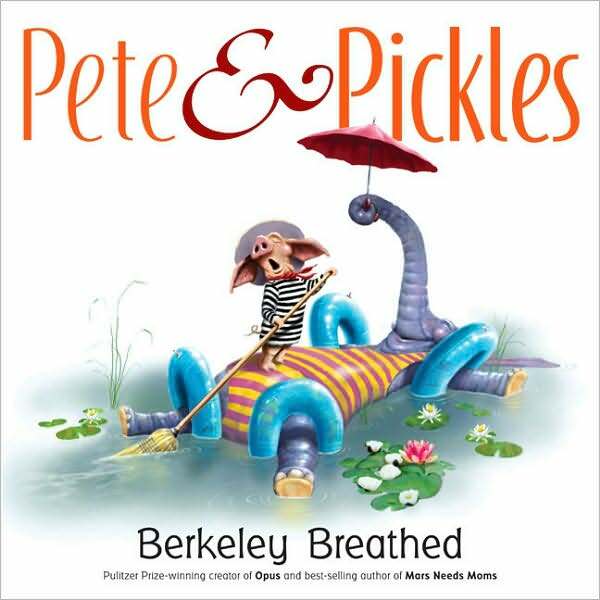 Pete & Pickles by Berkeley Breathed. Pete is a perfectly practical pig. He likes to have everything just so. He keeps everything in quiet order, follows the same routine every day, keeps his wife’s grave tidy. When he awakes one night to find an elephant hiding in his home, desperate for escape from the circus, Pete wastes no time returning him to the circus. But somehow, he finds himself going for a longer walk than usual. 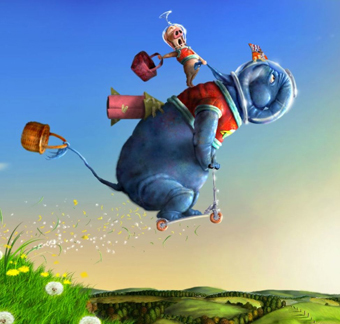 And somehow, he finds himself passing the poor elephant, whose name is Pickles, on the circus grounds. And inexplicably, he sets her free and takes her home with him. Thus begins Pete’s journey to live again, to do spontaneous and silly activities. Their new life is not without its problems and Pete nearly sends Pickles packing. Berkeley Breathed, best known for the much-loved Bloom County comic, has written a couple books for kids. He certainly doesn’t pull any punches when addressing some pretty profound ideas. In Mars Needs Moms! the boy’s mom is willing to sacrifice herself to keep her son alive, even though he was being a total pain. In Pete & Pickles the elephant risks drowning to keep the pig she loves alive. It’s pretty heart-wrenching, but there is more than enough silly adventuring going on around it to keep it feeling lighthearted in the end. A good book for kids 4-6. I loved Transformers when I was a kid. When I heard the first Transformers movie was being released, I was momentarily excited. After twenty minutes of watching it, I was no longer excited. My own kid is now the age that kids like Transformers. There’s certainly enough merchandising to keep him busy and an uncle or two who are more than happy to indulge him. To round it out, we just watched the original animated series together. The first couple seasons were just as I remember it: pretty much every character had a toy you could buy of it. Autobots vs. Decepticons, Optimus Prime vs. Megatron. But I had no idea how weird and intense and complex the show got in the third season, which was released after the animated movie and set WAY in the future in 2005. There’s these five-faced plump-lipped floating teardrop-shaped things, lots of other planets, a pink Autobot whose only role seems to be that she’s a girl. It’s really bizarre. And when Optimus comes back to life (I didn’t know he died!) all wrong and loses an arm and finally explodes, it’s kind of horrifying. My son still totally digs the Transformers; I think he was pretty confused the third season. I recommend the first two, but leave it there. The rest is just really surreal and at times kind of disturbing. 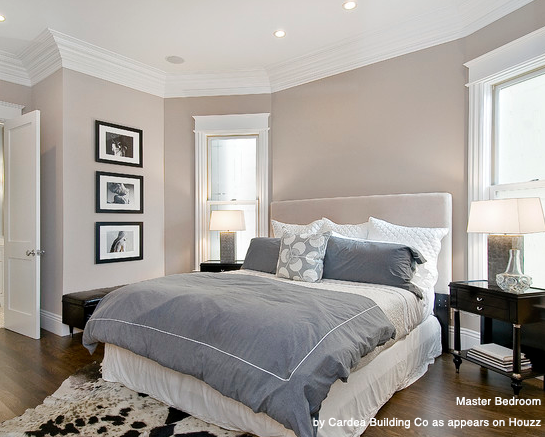 If your bedroom is in need of a facelift, a little attention to the crown molding can be just what the doctor ordered. Crown molding is an architectural detail that can turn what would otherwise be a visually uninteresting box of a room into something special. Better Homes and Gardens goes so far as to say that “trim and molding are like jewelry for your home: made to give basic walls, ceilings, entryways, and furniture a finishing look.” This Old House equates it to the icing on the cake: “not all cakes need icing, but they’re arguably better with the sweet concoction. The same goes for a room decked in trim.” I completely agree. What do you think? Crown molding can have a powerful effect on the overall look of your room. It helps smooth the hard angles formed where the walls meet the ceilings, and gives your eye something interesting to look at as it drifts upwards along the walls. Crown molding whispers old world charm and elegance; however, crown molding isn’t limited to any particular style of design. 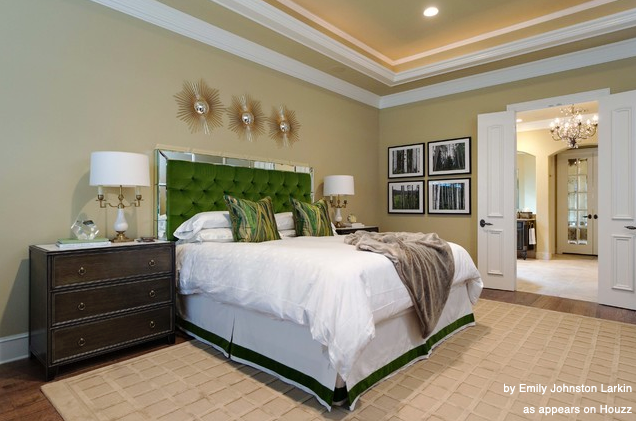 Whether you’re creating a classic, modern, contemporary, or rustic bedroom; a bit of crown molding is sure to look great. The style that works best for you really just depends on your personal taste and and budget. You can even mix and match styles to create a truly unique look. And once you’ve selected a style for the trim, i.e., its “bones”, there are even more options to chose from in terms of the finish. If you already have crown molding installed in your room, refinishing it can be a cost-effective way to bring new life to your room. One of my favorite ways to finish crown molding is the understated elegance of aged tobacco. 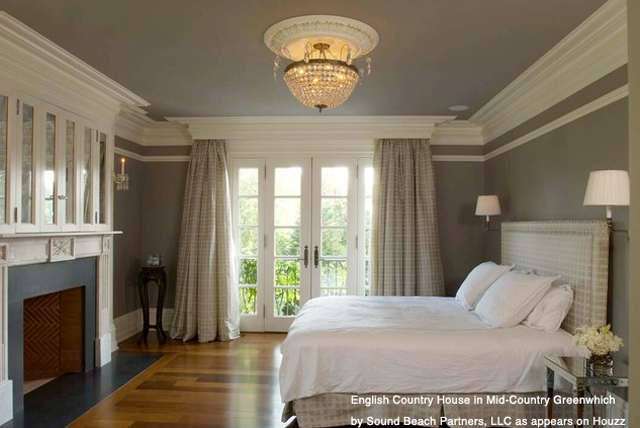 Since there are so many options to consider when choosing crown molding for your bedroom, or any other room of your home for that matter, the best way to get a sense of what you like is to see what other people have done. The crown molding channel on Houzz is a great place to start.